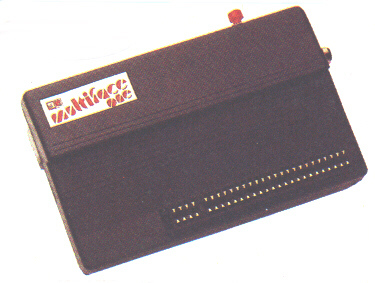 The No.1 Multipurpose Interface For the 48K Spectrum. O- Internal 8k ROM and 8K RAM enable fully automatic saving of anything onto Microdrive, Wafadrive, Beta or Opus, Kempston or tape. O- Extensive Multi-Toolkit to study/modify/develop/programs. Peek/Poke the entire 56k. O- Kempston compatable joystick interface. O- Does not use any part of the Spectrums RAM and does not require software. O- Menu driven commands with single key commands. O- Powerful and efficient compressing system. Saved programs use less space. O- Saved programs run independently without the interface. Since I last looked at the Multiface One from Romantic Robot, they have up-rated it - at no extra cost - and it is now probably the best back-up device around. The reason is that now it can do far more than just back-up programs, something it is remarkably good at anyway. Externally it looks muck like the old Multiface - with a Kempston compatable joystick interface on the left hand side, a button on the top which when pressed becks up the entire contents of memory to a variety of storage medium, and a through port for other add-ons. The video socket has been replaced by a switch which can be used to make the Multiface transparant to programs. Pressing the button brings up a menu at the bottom of the screen with five main options. Return takes you back to the program as though nothing had happened - an exit option tries to put you back in Basic if possible. Save does the obvious and saves the memory to Microdrive, Wafadrive, or either Beta or Kempston disc system - state which when ordering. Optionally you can just save the screen. Copy copies the screen to a ZX Printer, or a full sized one if you have a Kempston 'E' or LPrint III attached, and Tool enters the Tool-Kit part of the program. This allows you to enter any part of the Spectrums memory, either an address at a time, via a window which displays 128 bytes or access the Z80's registers - all with the display in hex or decimal. The last option, Jump, is potentially useful. The Multiface contains 8k of RAM which normally is used to hold various bits of the backed-up program. You can put your own program in this RAM and then use this option to jump into it. It might be a dissassembler, Basic tool-kit or whatever you want.